20 oz Coffee is rated 3.5 out of 5 by 178. Rated 5 out of 5 by econn from perfect size! I got this to use as a smaller water bottle that would fit in my cup holder. I was hesitant about the flip top lid but I love it! Very secure and pleasant to drink from. Rated 5 out of 5 by Greytfan2 from Love it!! Keeps my ice water cold all day. Fits perfectly into my cup holders in all 3 vehicles too. Easy to clean and fill without making a mess. Rated 5 out of 5 by Brittni94 from Best cup out there! Bought one for me and one for hubs for his birthday, keeps our coffee hot longer than any other cup we have tried!! Plus it's clompletely sealed so if our toddler grabs it, he can't spill it. Also doesn't get hot on the outside. Love the colors an features and will definetly be purchasing more soon! Rated 5 out of 5 by Mark on Maui from Perfect size I bought two of these, one for my wife and one for me, even though we each had one, because we love them, and are concerned that this size and cap style aren’t at any of the retail stores that carry Hydroflask. That’s how much we love them! Rated 5 out of 5 by emmi from LOVE! I love this mug. I am in nursing school and bring it EVERY day a long with my 40 oz hydro for water. Rated 5 out of 5 by Misti from The best! I’ve wanted one for about a year since friends bought some for camp coffee. I was hesitant to spend the money but found mine on sale.Quality design and materials worth every penny. i absolutely love it! Rated 5 out of 5 by juliette from Love it!! So happy with this hydro, I have a 32oz as well and it’s so convenient that I can switch out the lids. This is a really great size and the frost color is so gorgeous! Highly recommend. Rated 5 out of 5 by madisongribb from Wonderful and well made! Love this product and how strong it is only compliant is that it does not keep hots for even six hours like advertised. Rated 5 out of 5 by draperkk from My Cup! I acquired a Hydro Flask a few years ago with a sipping top (did not have a cover over the hole) and every morning I make my tea and inevitably about once a week something would happen and it would spill in my work bag or my lunch bag but I loved the fact that it was just the right size and kept my tea hot until I was ready to drink it, that I wasn't willing to let it go, I even bring it with me whenever I travel. I bought myself this sealable Hydro Flask about a month ago and it is wonderful to be able to make my tea and literally throw it into my bag knowing that it will not leak and it will be hot when I am ready for it. The day I left it on the counter by accident, and opened it the next morning to make a new batch, the tea was still warm, not hot, but warm, I was impressed! I have already told many about my hydro-flask, but will continue to share my story. Rated 5 out of 5 by My Storey from Keeps liquids warm/cold The hydro flask was recommended to me because of the options. I love my hydro flask 20 oz coffee. I use mine for cold drinks. I have put ice in it left it out overnight in the morning the ice is still in it and hasn't melted much. I have used/purchased other brands of insulted cups none of them compare in keeping your drink cold/hot or keeping the ice from melting. Very well insulted. Since it comes with the flip lid I just wish they made a reusable straw you could insert in the flip lid. I don't like the wide mouth straw lid. Rated 5 out of 5 by Kick33 from Drink the Kool-Aid! You're welcome. This flask has been fantastic, but that being said, I prefer the feel of the tumblers for on the go drinks as this feels too "water bottle" ish for me and the tumblers have more of a traditional coffee cup to go feel in my hand. I have used it for coffee on the go, coffee at home, water on the go, and my 3.5 year old almost exclusively uses it now for his drinking vessel around the house because a steel straw can fit through the coffee lid hole and he loves the color (retired Blueberry - glad we got to try this out while it was on sale!). It keeps everything hot and cold for as long as advertised (here in FL that's kind of a big deal because you really do get to test that out), and the flip lid has been fine for me while drinking both hot coffee and water on the go. The flip lid doesn't seem to have poor insulation compared to the other lids I've used (tumbler lids being perhaps the weakest in the line due to exposed hole and the wide mouth lid being the standard to which I am measuring it by). While I can see how liquid can pool up around the mouthpiece, I extensively researched and read reviews on this product before purchasing, so I was nervous about the performance of the lid. I am satisfied to say that I have never had any amount of spillage in the way this item (or rather the lid) gets reviewed on so poorly. Maybe a drip here or there, but nothing out of the usual or messy. The only thing that was a bummer was when I dropped the bottle half full of water onto pavement the part that clasps down chipped off, but as the lid is still functional (maybe a little less "clicked" into place) we will continue to use. Rated 5 out of 5 by Tanya73 from Awesome product I bought them for myself and as gifts. My friend and mom love them. I love how it really does work. My coffee doesn’t get cold and they told me that they love it too. Rated 5 out of 5 by Coffee freak from Hot coffee throughout the day! I bought this for my husband, he said the coffee stays at a nice temperature even after 12 hours he made it! Of course fresh coffee is better, but when he didn’t have time to get coffee in the office this coffee flask does the job! Thank you!!!! Rated 5 out of 5 by Noe23 from Love it!! I got this a little over a month ago and I use it pretty much every day! Everyone needs one! Rated 5 out of 5 by EGabriel from A favorite Sad the color is being discontinued but I love the easy tab and can take a nice big cup of coffee with me on the drive to work. Rated 5 out of 5 by Rcprynldsn from Lava my hot tea! I bought this product specifically for my hot tea in the mornings. Absolutely love it because my tea stays warm even after I’ve arrived at work and on my days off, If I loose it, it’s still ready to drink when I find it! Rated 5 out of 5 by SRip925 from Perfect! Since receiving this I have pretty much been carrying it around with me almost everyday. I slide it into the side bottle holder of my backpack and have no worries of any spilling/leaking because the lid seals nice and tight. I also seem to take forever to drink my coffee and it keeps it hot for hours. The size is great, I love the color, and am so happy to have it. Is there a major difference between the coffee flask and a regular wide mouth flask? Besides differences in size they seem to be the same. No, the size and the cap they come with are the only differences. Is the opening the same size as the other wide-mouth bottles? Yes, the mouth size of this is the same as other wide mouth flasks. How secure are the lids? For example, can I put this in my backpack and rest assured that it won't spill? What are the dimensions of this cup? How tall? How wide? 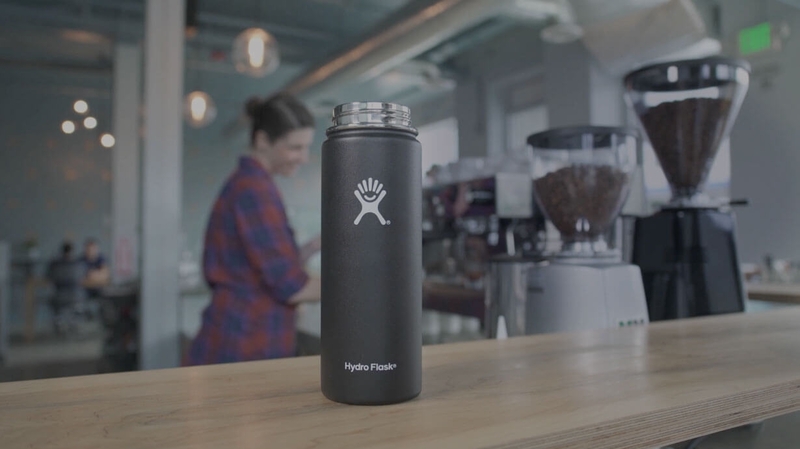 Does the 20 oz coffee come with the hydroflip lid as pictured? Yes, the flip cap does come with the the flip cap. It would come just as the picture shows it. does the 20oz fit in a cars cup holder? Product dimensions can be found on our FAQ page. You can see them here: http://www.hydroflask.com/frequently-asked-questions/ Usually, you are fine until you get to the 32 oz flask. how do you clean the inside with coffee stains? A good one to use is take about a teaspoon of baking soda and some water to make a thick paste. Use a bristled bottle brush to scrub the entire flask thoroughly. Then fill the flask up with boiling water. Leave the cap off the flask. Allow the flask to soak in the baking soda/water mixture until the water inside the flask is cool to the touch. Finally wash and rinse the flask with dish soap and allow it to fully dry.